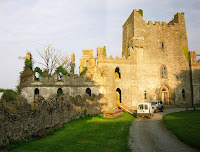 According to the legends, Leap Castle was built in the late 15th century on a Druidic site by the O'Bannon family and originally called "Léim Uí Bhanáin," or "Leap of the O'Bannons." The O'Bannons were the "secondary chieftains" of the territory, and were subject to the ruling O'Carroll clan. Leap Castle is an Irish castle in Country Offaly, about four miles north of the town of Rosacrea on the R421, and has long been regarded by many to be the most haunted castle in Ireland and this is not surprising considering its bloody history particularly during the occupation of the O'Carroll family. In the 16th century, feuding and bloodshed between warring clans was quite a common occurrence and there are many stories of guests been invited to dinner at the castle and then being massacred before they could devour their desert. There is supposedly a network of dungeons carved out of the rock below the keep with secret chambers and bricked up areas and human remains have also been discovered there. Many visitors to this site have spoken of feelings of real terror and a sense of evil in some places and others have related encounters with a ghostly Lady in a red gown. The most terrifying of all reports is that of a small hunched creature which has appeared from time to time accompanied by the stench of a rotting corpse and the smell of sulphur. The creature is referred to as the "It" or the "Elemental". When the O’Carroll family came here, they had a nasty habit of murdering people and dropping the mortal remains down a hole in the wall called an “oubliette.” Once in the hole, the remains were promptly forgotten about. One O’Carroll chieftain murdered his own brother, a priest, for starting Mass too promptly. Hence, the top floor of the castle is called the Bloody Chapel. It was, however, lower down in the castle that “It” is experienced—an elemental force of evil with the head of a sheep and the stench of death. The small, windowless room below the oubliette was the final resting place for scores of victims who were initially locked in a hidden dungeon off the Bloody Chapel. This room had a drop floor, and prisoners were pushed into the room where they fell to their deaths—either impaled on a spike below, or if they were unfortunate enough to miss the spike and die a quick death, they slowly starved in the midst of rotting, putrid corpses. Around 1900, workmen who were hired to clean out the windowless room discovered hundreds of human skeletons piled on top of each other. It took three full cartloads to remove all of the bones, and one theory is that some of the remains were those of Scottish mercenaries hired by O’Carroll who had them murdered when it came time for payment. Mysteriously, among the bones, workmen also found a pocket watch made in the 1840s. Could the dungeon still have been in use back then? No one will ever know. Shortly after the gruesome discovery in the dungeon, playful dabbling in the occult may have caused the reemergence of the evil spirits. In 1659, ownership of Leap Castle passed in marriage from the O’Carroll family to an English family, the Darbys. The Darby family turned Leap into their family home, with improvements and additions and landscaped gardens. In the late-19th century, descendants Jonathan and Mildred Darby were looking forward to raising their family here. The occult was the fashion of the day, and Mildred Darby did some innocent dabbling, despite the castle’s history and reputation for being haunted. In 1909, she wrote an article for the Journal Occult Review, describing her terrifying ordeal: “I was standing in the Gallery looking down at the main floor, when I felt somebody put a hand on my shoulder. The thing was about the size of a sheep. Thin, gaunt, shadowy...its face was human, to be more accurate...inhuman. Its lust in its eyes, which seemed half-decomposed in black cavities, stared into mine. The horrible smell one hundred times intensified came up into my face, giving me a deadly nausea. It was the smell of a decomposing corpse.” The spirit is thought to be a primitive ghost that attaches itself to a particular place. It is often malevolent, terrifying, and unpredictable. The Darbys remained at Leap until 1922. Being the home of an English family, it became the target of the Irish struggle for independence. Destroyed by bombs and completely looted, nothing but a burned-out shell remained. The Darbys were driven out. The castle lay in ruin for decades. But then, in the 1970s, it was purchased by an Australian, who had a white Witch brought in from Mexico to exorcise the castle. She spent many hours in the Bloody Chapel and when she emerged, she explained that the spirits at Leap Castle were no longer malevolent, but they wished to remain. an architectural relic of the past. already understood if old buildings are identical with ghost stories. talking about ghosts, we are among the top believe it or not. Who can prove that real ghosts exist?. who have experience would be to believe, but what if those who did not experience it? (@the international times) That depend what other believe. Some people believe ghost does exist eventhough they haven't seen any of them but they can feel their presence, while skeptic people believe that every phenomenon have a scientific explanation, not because supernatural cause. Thank you so much. You can post the award anytime you want. Have a nice day! Huh, if I ever take a trip to Ireland, this is one place I would be very likely to avoid. such as in Jakarta, we know the legend of the "Si Manis Jembatan Ancol"